All customers who are eligible to run MacVector 17 should either use this link to download the MacVector 17 installer or use the MacVector | Check For Updates... menu item to use the semi-automatic updater. (a) check that you entered the latest activation code you received from MacVector. 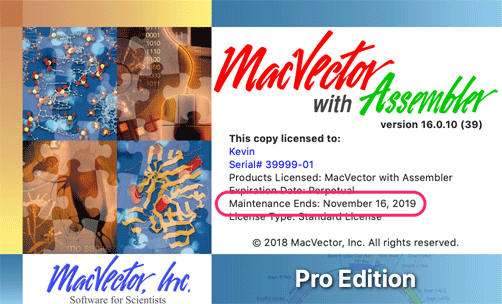 Look for e-mails from support@macvector.com or contact your Lab Manager or local System Administrator to make sure you have the latest code. You may just need to enter the latest code to activate MacVector 17. (b) if you need to downgrade to restore MacVector functionality with an outdated license, you can find all of the MacVector installers here.